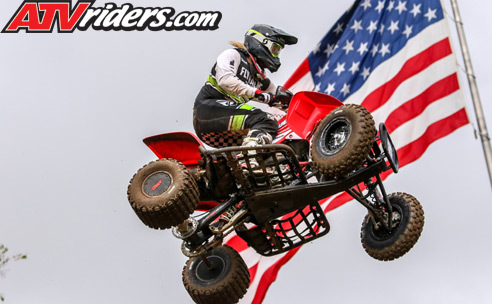 Salisbury, NC (7/26/2018) - Rockford Fosgate/TiLube/Honda racers Noah and Haedyn Mickelson had an up-and-down weekend during the AMA ATV Motocross National Championship races at RedBux MX in Buchanan, MI. Noah Mickelson won Pro Sport, while Haedyn Mickelson finished seventh in Pro Am. It rained off and on all weekend, making the sandy track rough and difficult. Noah Mickelson made the most of the trying conditions and went 1-1 in the Open Pro Sport motos. His first victory of the season places him fifth in the championship despite missing four races due to injury. He went 6-9 for an overall ninth-place finish in Pro Am. Haedyn Mickelson started third in the first Pro Am moto, but a mechanical issue put him a lap down. Not one to give up, he went back out and finished ninth. In the second moto, he battled his way up to fifth for an overall seventh-place finish. Though Mickelson is now second in Pro Am points, he’s ready for a showdown at the final race. With only six points to make up, he will do everything in his power to secure the championship. Noah Mickelson may only be back for his second race since his injury, but you wouldn’t know it by his dominant performances in the past two rounds, and he backed up his success at Unadilla with the Pro Sport win at Red Bud MX. 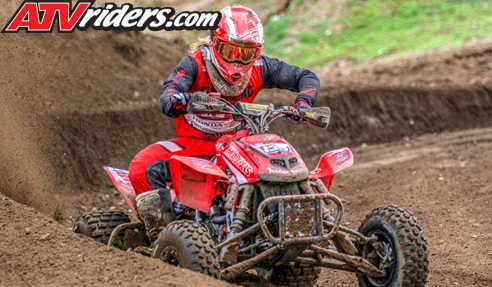 Haedyn and Noah Mickelson will be back in action as the Rockford Fosgate/TiLube/Honda Team readies to finish out the season strong at the Loretta Lynn Ranch in Hurricane Mills, TN August 11-12.